Today I invited three families over to sign Christmas cards (I had an activity set up for all the children, which I will share tomorrow). We each had our own set of Christmas cards, envelopes and stamps. Some of us wrote letters, included photos of our family, or kept it simple. My number one piece of advice is to make sure you have plenty of pens handy! Here is a look at my Christmas cards. I purchased a box of 16 cards on Clearance from Dayspring.com. I love the Scripture! In addition to opening up your home, you can serve affordable snacks and beverages for your guests. Here is what we had set out for the day. I purchased two jugs of apple juice from the Dollar Tree for a $1 each, along with the disposable cups. The sparkling blueberry lemonade was $2.50 from Hannaford and the cookies were a little over a $1 per box from Walgreens (I purchased two flavors - lemon and raspberry). I love putting snacks and treats in a cake stand. It just looks so elegant! Before my guests left I had a surprise for them. I gifted each of them an ornament (I purchased these on clearance last year from Kmart!) and a Christmas card that contained a CD full of classic Christmas music (an awesome 75% off find from Christianbook.com) They were so surprised and thankful! It felt good to bless them! So, there we have it! I encourage you to open up your home to a Christmas card signing. It is such a fun and productive way to get our friends together. It costs you hardly anything and allows you to be generous at the same time! Great, huh? We all are ultimately doing something to bless others this year with a Christmas card! 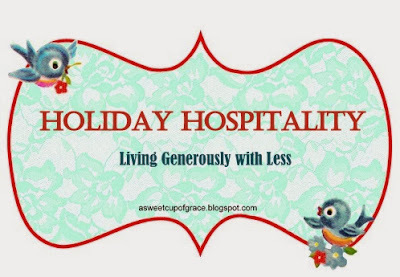 If you haven't already, check out our other posts in Holiday Hospitality Series!